I had never seen the Cairngorms so empty. After a quiet night at Braemar Youth Hostel (I had an 8-bunk dorm all to myself, and there were only 4 people staying in total) my friend Katy and I drove to the equally empty car park at the Linn of Dee. We tied our heavy winter boots to our sacks after deciding to make the 'long walk in' along Glen Lui in our approach shoes. This strategy was well worthwhile as it did not seem long before we arrived at Derry Lodge. We crossed the bridge over the Derry Burn, and passed old Scots Pines which gradually thinned out as we headed north up Glen Derry. To the northwest were the snow covered slopes of Sgurr an Lochan Uaine and Stob Coire Etchachan, which enclosed the steep valley up to the Hutchison Hut. That was still a long way away though. After crossing another bridge and heading still further north, we passed over increasingly wet and boggy ground. A fenced enclosure around younger Scots Pines was ahead, and we decided this was a good spot to don our boots, leaving our approach shoes in a drybag by the gate. A short distance more and we had to cross the Glas Allt Mor. In my usual fashion I wandered alongside the burn, trying to find the easiest place to cross. And, in my usual fashion I negotiated the crossing without any grace or panache. I don't even attempt to use stepping stones (I don't trust them...). I just go for the shallowest bit of water and hope that it doesn't overtop my gaiters. This time I was successful. We took the left fork in the track and made our way northwest and over another footbridge towards the Hutchison Hut. As we approached the hut, we noticed a trail of footprints, but really could not work out what animal had made them. I doubt it was a dog, as we had not seen any human footprints since the start of the walk. A deer? Probably not. A fox? Hmm. We followed the line of footprints right up to the hut itself. Built in 1954, the Hutchison Memorial Hut is more functional than it is vernacular. We started to have lunch outside the hut in the sunshine, but when it started snowing horizontally, we headed inside. The hut is definitely a very useful (life-saving, even) shelter from the elements. I wrote an unoriginal sentence or two in the bothy book. Once the snow abated, we started the ascent towards Loch Etchachan. The path was concealed by the snow so was difficult to follow, and in places we sunk to our knees in snow drifts. Eventually we reached Little Loch Etchachan – a magical and serene place. It was partially frozen, and the boundary between snow and frozen water was impossible to distinguish. Perfect white circles dotted the surface of the loch. On the other side, little birds fluttered about, catching the tiny insects that were scattered on the snow. We crossed the shallow outflow of the smaller loch and passed alongside the main loch, before starting the ascent northeast towards Beinn Mheadhoin, looking back towards the lochs, squinting because of the reflection from the snow. I decided to put my ski goggles on for a while. As we went higher, the visibility deteriorated to whiteout conditions. Our eyes played tricks on us, and ahead there was what looked like a penguin, bent forward into the wind. Surprisingly enough, it turned out not to be a penguin, but a rock in the grip of a spiky hand of snow. We continued upwards, carefully following our compass bearings, and eventually the first tor emerged from the clag. Then a second, then a third. We decided we were at the summit, and settled down in a convenient sheltered gap between the tors to have something to eat. The rock was clotted in snow. We considered heading off the mountain via an alternative route, to the northeast or the east, but the contour lines on the map seemed uncomfortably close to each other, so we decided to retrace our steps instead. This was not really possible, literally speaking, as our footprints had already been virtually obliterated. We carefully took bearings from the map, checked each other's readings, and followed our compasses into the white fog, again passing the other tors, which reassured us that our bearings were correct. We were relieved when Loch Etchachan eventually came into view once more. It was surprisingly late now – 5pm – and we still had several hours of walking ahead before we would reach the car. So we picked up the pace down to the hut, but not too fast as the snow was very slippery. A quick stop at the Hutchison Hut and then onwards, down the glen. We had not seen a single other soul all day. Until now. Someone was heading up the glen, and when they reached us they asked urgently whether they were close to Bob Scott's Bothy. He could not believe it when we informed him that he was heading the wrong way and that it was perhaps 7 kilometres in the other direction. Earlier that morning he had decided to separate from his walking companion and make his own way to Bob Scott's. But he had no water, no food (thinking it was good to walk on an empty stomach) and no map. He was completely lost. He eventually accepted some liquid and food. Had we not met him and guided him down to Bob Scott's where his bike and walking companions were waiting, he might have had a very difficult night in the wintry mountains. We eventually reached the car after 8pm, after more than 11 hours walking. It had been a long day but a really rewarding one, and we felt extremely fortunate to have had the hills almost to ourselves. Last edited by GariochTom on Wed May 02, 2012 10:42 pm, edited 1 time in total. That's a great walk at this time of year - really enjoyed yer account. Well done on sorting out the dafty. I think you may well have saved his life. See a bag o ricky pig? Enjoyed reading that and loved your penguin! I've yet to complete Beinn Mheadhoin. Had to abort at Loch Etchachan when my pal broke ankle and we had cal out rescue! Really enjoyed that report liked the penguin photo and as the rest has said you probably did save his life well done. 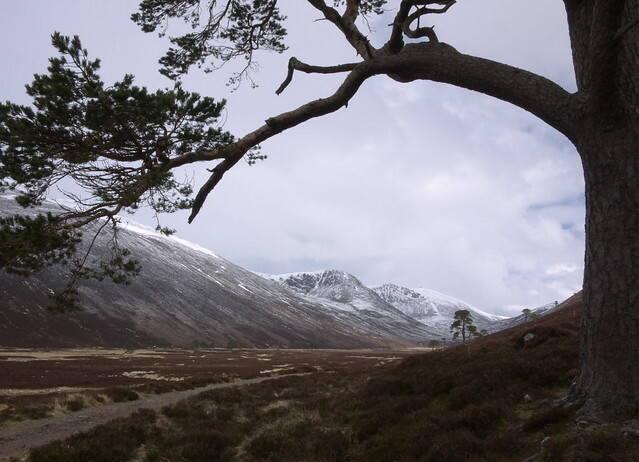 Jock McJock wrote: Enjoyed that report Not had the pleasure of venturing into the Cairngorms yet so nice to read about it and see your pics. dogplodder wrote: I've yet to complete Beinn Mheadhoin. Had to abort at Loch Etchachan when my pal broke ankle and we had cal out rescue! There's something about Beinn Mheadhoin...lots of people seem to have several failed attempts to go up it (we had 2 or 3 unsuccessful attempts before managing to bag it!). I dread to think what would have happened to that lost walker if we had chosen a different descent route and not met him going up the glen in completely the wrong direction. Nice report GariochTom. Quite a long walk for the one munro so good effort. Excellent set of photos. As has been said that guy was sooooo lucky that you came along. Nuff said. kevsbald wrote: See a bag o ricky pig? ... eh? Can't even guess what that means! Cheers for sharing, and I hope you were thanked most graciously by someone else ! It was going to be my 100th Munro too (and bagged on my birthday) but that didn't quite work out. It was still well worth the effort though! You've had a good interesting walk and it was odd to see so little snow and ice. Loch Etchacan is often still frozen over and under snow at this time of year. Re. the footprints....a fox's prints in the snow appear as a single line of prints, as the rear feet are placed in the holes made by the front ones....a bit of info from my gamekeeper cousin. Border Reiver wrote: Re. the footprints....a fox's prints in the snow appear as a single line of prints, as the rear feet are placed in the holes made by the front ones....a bit of info from my gamekeeper cousin. Nice one Tom. A lot more snow than when I was in the area 6 weeks earlier - its been a really topsy-turvy winter. 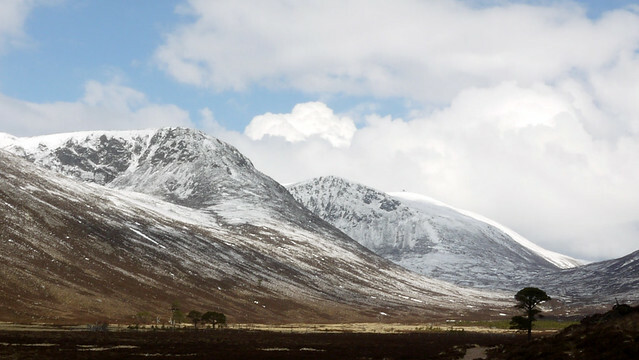 Great report...havent been to the Cairngorms yet, but following your story up the hill it makes me want to go now. Little Loch Etchachan is a really great shot! Also like the memorial hut!